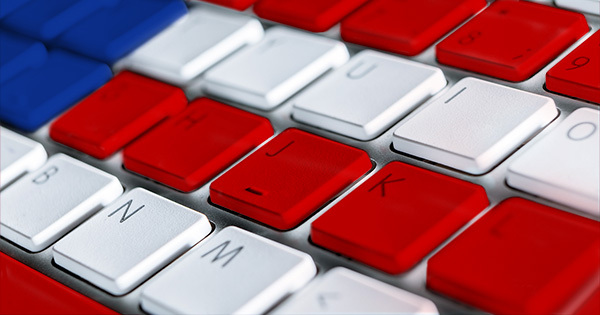 Happy 25th Birthday World Wide Web: How Many Americans Use You? 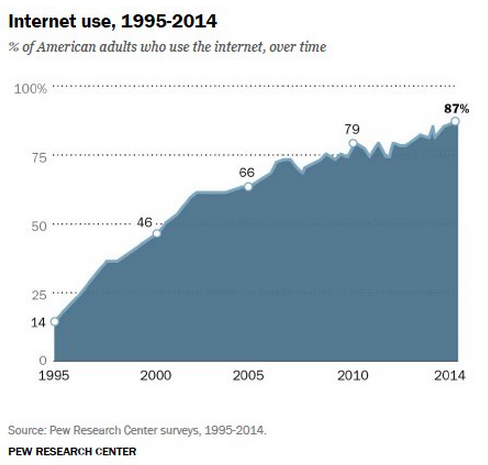 Happy 25th Birthday, World Wide Web: How Many Americans Use You? Intuitively, we all know that computers, the Internet, and cell phones have transformed the lives of Americans—weaving themselves into our workplaces, our homes, our cars, and even our vacations. But how ubiquitous are these technologies? How many Americans actually use them? ● 87% of U.S. adults say they use the Internet at least occasionally—the highest percentage since Pew began measuring adoption in 1995, when just 14% of U.S. adults had access. ● Nevertheless, gaps in usage remain. Younger, more educated, and wealthier Americans are more likely to use the Internet than older, less educated, and less well-off Americans. 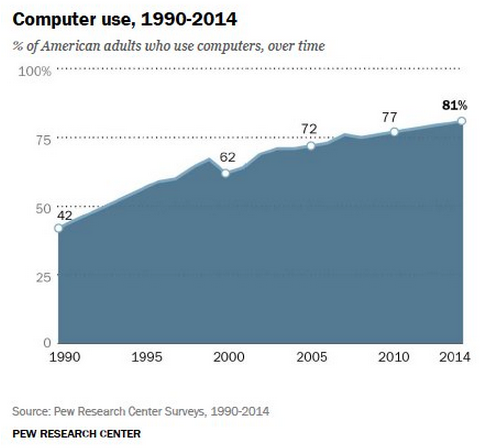 In 1995, 42% of U.S. adults said they used a computer at their workplace, at school, at home, or anywhere else, even if only occasionally. Today, 81% say they use laptop and desktop computers somewhere in their lives. Age remains a good predictor for computer use: 56% of adults ages 65 and older now say they use a computer, compared with 89% of 18-29 year olds. ● In 2000, 53% of U.S. adults said they had a cell phone. ● Today, 90% have a cell phone and two-thirds of those say they use their phones to go online. ● 98% of 18-29 year-olds say they have a cell phone, compared with 74% of adults ages 65 and older. 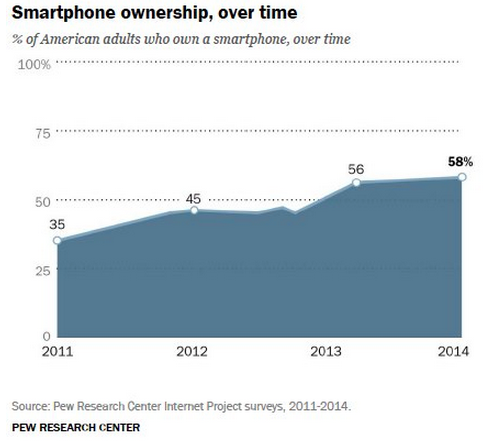 ● 58% of U.S. adults say they have a smartphone. For marketers, this data is a good reminder that the “digital” world has become deeply intertwined with the “real” world for many Americans. As these channels have steadily evolved, so too have advertising, branding, and communication tactics. Now that Internet, computer, and mobile web usage is clearly prevalent, these digital marketing approaches should be viewed as mainstream and essential, not as separate and experimental. Learn how mobile marketing can make a major impact. Contact MDG Advertising today at 561-338-7797 or visit mdgadvertising.com.